If your toilet is overflowing when you take a shower, there is an obstruction located between the toilet and the main sewer line. This is causing the water from the shower to back up and overflow at the first drain it reaches, which happens to be your toilet. There are a few things you can do to remedy the problem before calling in the professionals. A good starting point for a toilet with an obstruction is to use a plunger to attempt to dislodge whatever may be causing the backup. Use a toilet plunger with an extra rubber flange, designed specifically for toilets, so that the best seal possible can be made with the bottom of the bowl. Plunge in steady, rhythmic strokes. 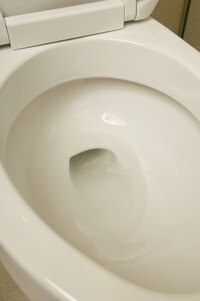 Check the water in the bowl for any signs of bits of paper or other material that would indicate a clog is breaking up. If your plunging isn't giving you any results, it's time to step up to a plumber's snake. A snake is basically a long length of wire or cable with a corkscrew at the end. The handle of the snake allows the operator to turn the corkscrew, dislodging clogs and opening up the drain. Feed the snake down the toilet as far as you can, and feel for any obstructions. Turn on your shower and see if the problem is remedied. Pulling the toilet from the drain allows you to get a better look at where the potential clog may be located, and also will allow you to feed your plumber's snake farther in to the drain. Most toilets are held down by a pair of bolts on either side of the bowl, as well as the water feed lines. The drain is sealed with a wax seal, which will need to be replaced before re-installing your toilet. Feed the snake as far down the drain as you can, and run the shower to see if the overflow continues. Most modern homes have a drain clean-out plug located somewhere in their drain line. This plug resembles a large screw-in cap and is located on the end of the drain in your basement, crawlspace, or outside the home. This plug can be removed and gives the homeowner access to the drain line. Remove the plug and feed a snake down the line. Remove any clogs or debris, and ensure the problem has been remedied. If the problem is located further down the drain, you may need to call in a professional plumber to examine your drain and sewer line.